This is a new 2 step deep cleaning treatment to keep your roller train in tip-top condition. 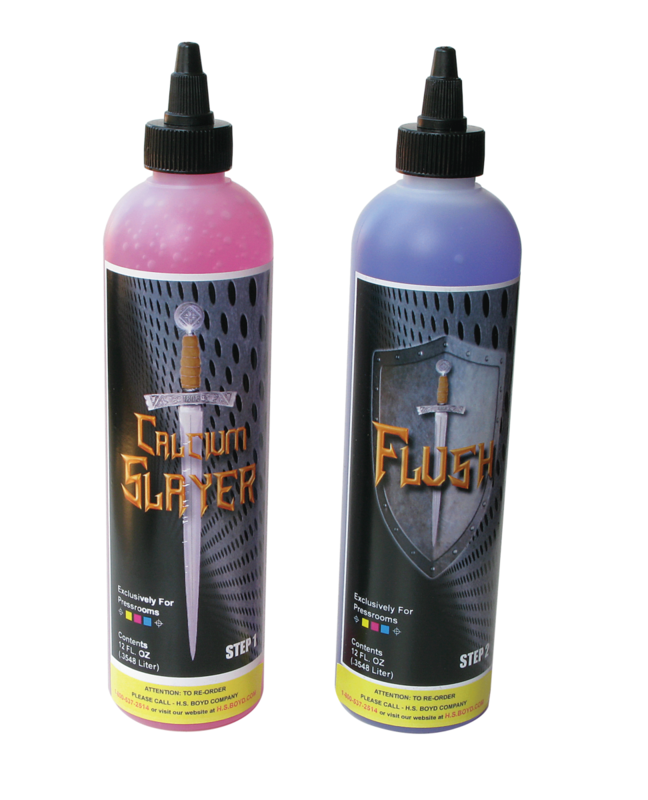 Calcium Slayer and Flush represent a breakthrough in the cleaning of rubber offset printing rollers. A powerful two-step roller cleaning system, they are non-hazardous organic compounds that are safe for the user and the environment. Please review SDS sheets and directions thoroughly before using Calcium Slayer and Flush. Safe and effective is no longer heresy. Please review safety guidelines in the Safety Data Sheets before using the Calcium Slayer & Flush Products. As with any liquid pressroom products, safety glasses and gloves are recommended for personal safety. Follow directions as prescribed. If left on metal surfaces for extended periods, products may discolor metal. If spills occur, wipe down and rinse metal surfaces with clean water. Remove all ink from press rollers. Isolate ink train from plate cylinder. Don’t drop the forms! With press stopped, apply a single ¼” wide bead of pink Calcium Slayer to a driven roller in the ink train. Don’t be sloppy !! Reverse the press 2-3 revolutions then set wash-up speed to approximately 300 feet per minute/6000 impressions per hour. Allow to run through ink roller train for 2-3 minutes. Do NOT rinse Calcium Slayer. Proceed directly to Flush ( Step 2 ) application. With press stopped, apply a single ¼” inch wide bead of blue Flush to the ink roller train. Reverse the press 2-3 revolutions then set wash-up speed to approximately 300 feet per minute/6000 impressions per hour. APPLY LIBERAL AMOUNTS OF CLEAN HOT WATER to ink roller train until Flush and contaminants are purged from the rollers. Finish with usual press wash procedure. Calcium Slayer and Flush is a " Monday Morning” procedure, not a "Friday afternoon” job. We recommend running the press immediately following a Calcium Slayer and Flush treatment.